Since 2015, Kudos Audio have worked closely with industry leaders Linn and Devialet to bring the incredible performance of Linn’s Exakt and Devialet’s Expert technology into the heart of Kudos’ top-of-range loudspeakers, using active digital amplification. Now, Kudos are delighted to be working with British brand Exposure Electronics on a further development of active amplification. Exposure’s brand new VXN crossover enables active analogue amplification. What’s more, it can be applied not only to Exposure’s own award-winning electronics, but potentially to any pre/power amplifier combination. In an active system, rather than the usual scenario of one power amplifier channel per loudspeaker, there is one power amplifier per drive unit. So in a 2-way loudspeaker design, there are effectively 4 amplifiers driving the speakers, and in 3-way design, 6 amplifiers. This is achieved by by-passing the loudspeakers’ internal crossovers. 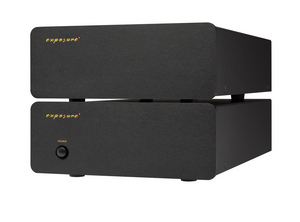 Instead, the external VXN crossover unit - which has its own separate, fully linear, power supply - is connected between the preamplifier and the power amplifier(s). Now, with nothing between the power amp and the loudspeaker’s drive units, the result is superior control, grip and dynamics. Join Exposure in room 212 to hear a very special prototype preview of the new VXN analogue active crossover, with the Kudos Titan 606 loudspeaker. See Exposure Electronics in room 212 on the second floor.